Flexible vinyl metal core fits unfinished edges between .010" and .030" inches thick. Single lip creates tighter grip. 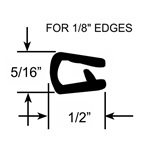 This part can be used on any unfinished edge where a rubber seal is needed. Black edge trim seals.Fits edges .010" to .050" inches thick. Double lipped for tighter grip. Constructed with vinyl metal core for strength. 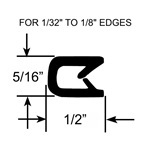 This part can be used on any unfinished edge where a rubber finish is needed. Flexible vinyl metal core fits unfinished edges between .032" and .125" inches thick. Pinched top inner lip creates a tight grip. 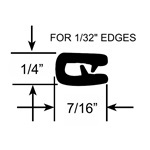 This part can be used on any unfinished edge where a rubber seal is needed. Flexible vinyl metal core fits unfinished edges between .090" and .190" inches thick (1/8" to 3/16"). Standard single lip trim. 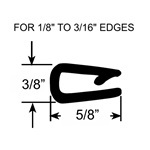 This part can be used on any unfinished edge where a rubber seal is needed. Flexible vinyl metal core fits unfinished edges between .085" to .210" inches thick (1/8" to 3/16"). Single inner lip grips surface. 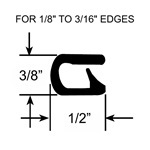 This part can be used on any unfinished edge where a rubber seal is needed. Black finished edge trim seals with double lips. 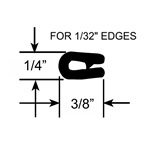 Fits edges from .135" to .250" inches thick (3/16" to 1/4"). Manufactured with a vinyl metal core for added strength. 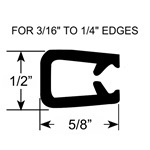 This part can be used on any edge where a rubber finish is needed.